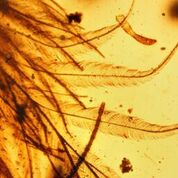 A dinosaur tail complete with its feathers has been discovered trapped in a piece of amber. Even though these aren’t the first to be found, earlier specimens have been difficult to definitively link to their source animal. This tail consists of eight vertebrae from a juvenile preserved in 3D with microscopic detail. Professor Mike Benton from the School of Earth Sciences at the University of Bristol, former President of the Geologists’ Association, says ‘It’s amazing to see all the details of the dinosaur tail – the bones, flesh, skin, and feathers – and to imagine how this little fellow got his tail caught in the resin and then presumably died because he could not wrestle free. There’s no thought that dinosaurs could shed their tails, as some lizards do today’.